This stunning villa is situated in the conservartion area known as Sandy Ridge near clermont. 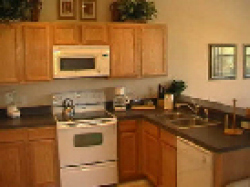 The property was constructed in September 2005 and has 4 bedrooms and 3 bathrooms. The two master bedrooms are on-suite and can accommadate up to 10 people. The villa has it's own private pool and spa which is totally enclosed for your comfort and overlooks a wooded conseration area.There is a fully fitted kitchen with seperate dining room and also a fully fitted utility room. The Villa is tastefully furnished and comes complete with bedding and towels as standard. 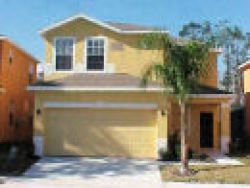 The villa is located close to Disney World and all other major attractions are within easy reach. Champions Gate is also close as are championship golf courses. 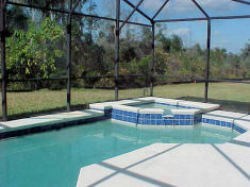 This villa will be your superb accommodation during your stay in the sunshine state see all the attractions and then relax in the pool at the end of a wonderful experience.